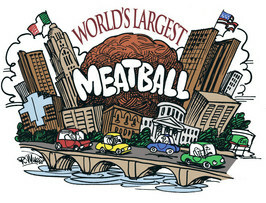 The Columbus Italian Club (CIC) is pleased to announce that the gigantic, 1,100-pound meatball created at the Columbus Italian Festival in October has been officially certified by Guinness World Records as the "World's Largest Meatball". The final weight of the massive meatball came rolling in at a staggering 1,110.5 pounds. Several onsite official witnesses at the Columbus Italian Festival verified the meatball, which took almost three days to cook, on Oct. 8, 2011. On August 5th 2013 the History Channel - More to History H2 ran a Meatballs episode on there "All You Can Eat" series that included a piece on the Worlds Largest Meatball. Click the link below to watch.